As our skins shrivel and sweat drips from our foreheads, the Indian and Pakistani soldiers have it worse with their thick, pressed uniforms and ostentatiously colourful headgear. From where we are sitting, soldiers march and display strength via their exaggerated movements, locals cheer with nationalistic fervour and girls go onto the stage to dance like free birds. 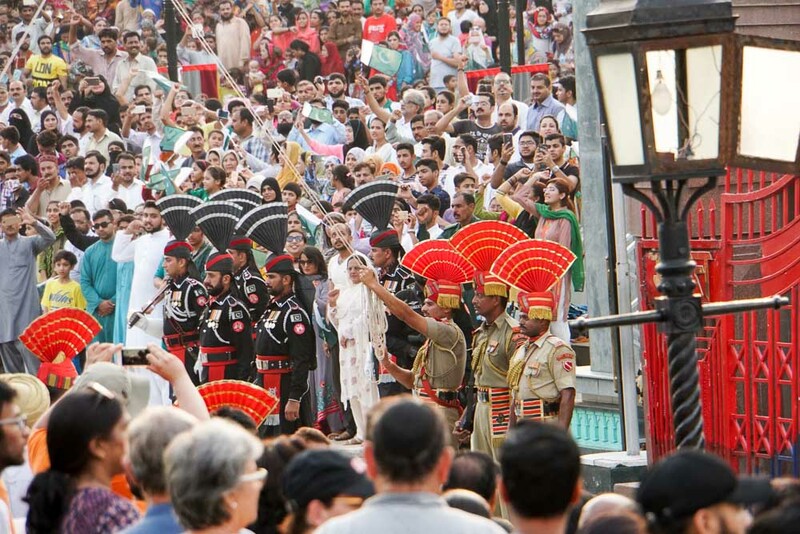 The Wagah Border Ceremony, located on the highway between Amritsar and Lahore, is definitely something I have never seen before. 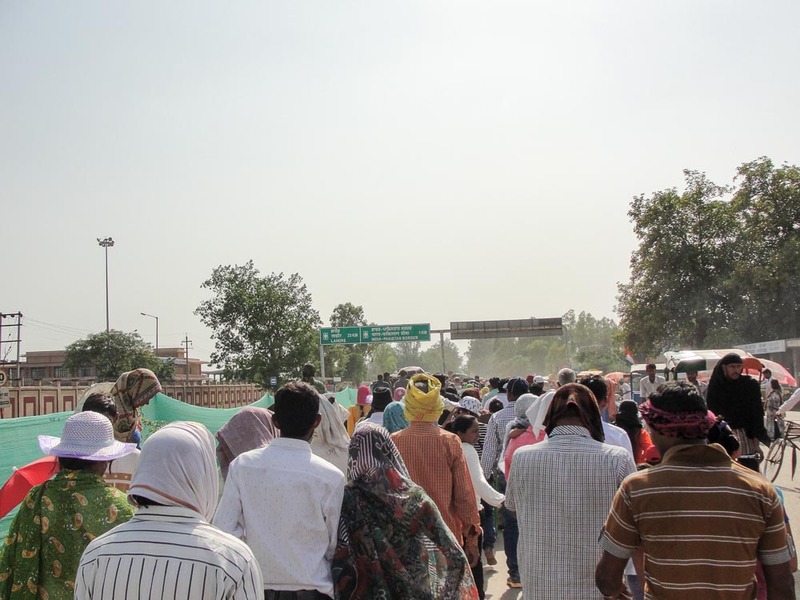 The journey from the Golden Temple area to the Wagah Border was a painstakingly long hour. 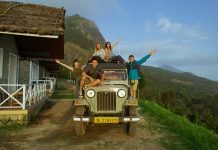 It is about 35km and there were six of us squeezing on the rickshaw – one beside the driver, three at the backseat, and 2 of us sitting at the back of the rickshaw. Other than the fact that it was really crammed, I was too tall to be sat down at the back and would always find myself craning my neck. The bumpy ride also meant that I found myself almost falling sometimes, having to desperately cling onto the seat. It didn’t help that I was also exposed to the scorching sun and many a times locals would gawk at me like they have never seen a foreigner. Point is, it would be much better if you could get yourself a seat inside the Rickshaw. Imagine my relief when we finally reached our destination and that I didn’t drop off during the ride. Upon disembarking, the 1km walk from the drop off point to the ceremony might seem daunting especially under the blistering heat. However, the situation isn’t so bleak – despite the swarming mass of people even way before the ceremony begins, there is a “VIP” queue catered for foreigners which is much shorter and less chaotic. It was also rumoured that bags weren’t allowed into the premise although the checks aren’t always strict — without risking it, we left ours at the accommodation and only brought the essentials. *Pro-tip: Bring your passport as foreigners get a separate (express) queue from the locals. After completing 1km of security checks, snack and drink store stops, we finally managed to get in and witness the vast majesty of the stadium. People decked in colourful sarees and traditional costumes filled the pitch and soldiers embellished with badges and pins stood firm, guarding the prestigious ceremony. We were ushered to the tourists’ seats, away from the locals. 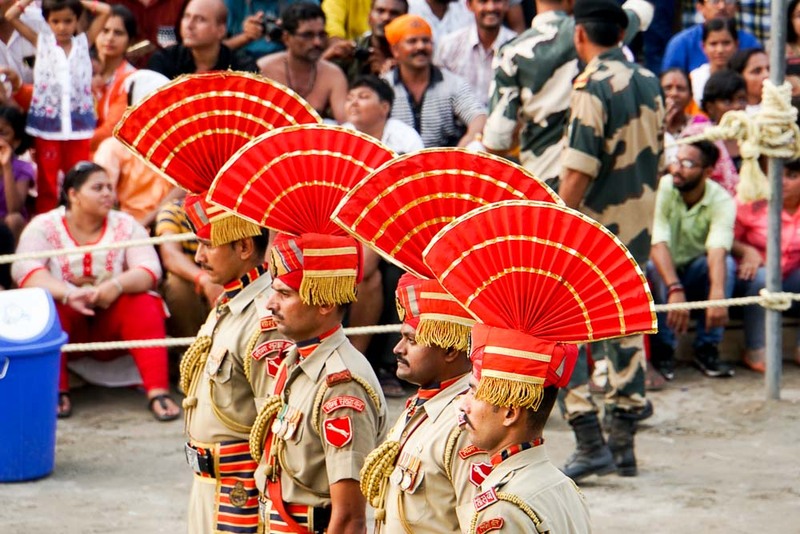 Soldiers partaking in the ceremony – the Border Security Force (BSF) – had a red head gear, spreading out like a peacock’s feathers. It was a really unique ceremonial uniform; pretty but also giving an aura of importance and solemnity. We sat on those concrete steps for what seemed like hours before anything happens. Then, all of a sudden, the action began. Popular local music blasted through the speakers in front of our stand and local females started to walk to the centre of the “stage”. They were slowly moving their bodies to the music and when more women joined them, they broke out into a cheerful dance. 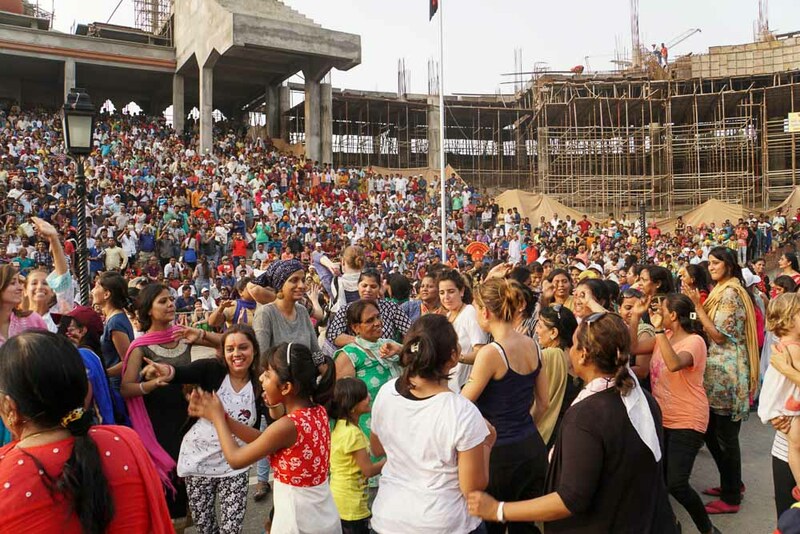 It was electrifying – women were dancing, hollering, and radiating their pride for the country. Only women were allowed to join the party while men watched from the stands with their smartphones and cameras aloft. 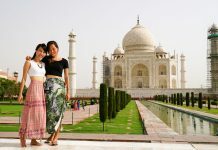 My female friends – Clara, Charlotte and Miao – clearly had a whale of a time as they screamed “Jai-ho!” and frolicked on the stage with women of all ages and nationalities. One thing I know after the ceremony was that Indian women sure know how to dance – even the older women had zest and verve in their movements. After the females retreated back to their seats, some girls and ladies were invited to carry the flag and run to the border gate and back. They bore the flag proudly and ran across the stage like a torch race. The crowd cheered boisterously for them which is really revealing of the national pride people possess for their country. One girl slipped and fell on the floor, but she courageously picked up the flag and finished the race with her head held high – it gave me goose bumps to witness how patriotic and proud the locals were. When the festivities finished, the ceremony began and soldiers thrusted their legs upwards and manoeuvred passive aggressively. They marched into neat formations and often kicked their legs high up as a way of displaying strength. The parade was really grand and exhibited the discipline of the soldiers guarding the border. It was also to show Pakistan how united India is – with their soldiers ever-ready and loyal to the country. The competitive cheering between the two nations, with each shout getting louder on both sides, also gave me chills. The atmosphere was intense and filled with nationalistic fervour, and I have never witnessed anything like this before. 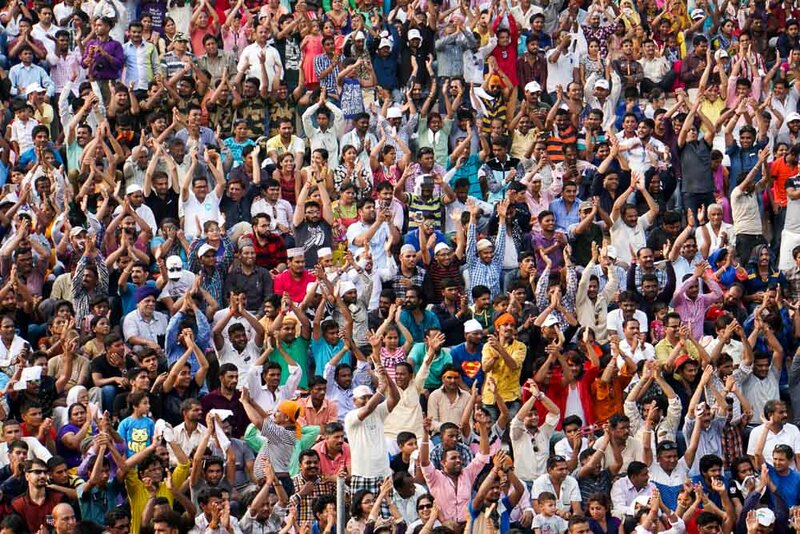 Sure, Singapore has its own parade of fireworks and light display; but in India the people stole the show with their flag-waving and patriotic slogans. After an hour of parade and cheering, the ceremony came to an end with soldiers from each side standing off and shaking hands. It is alternatively a symbol of the two countries’ rivalry, as well as brotherhood and cooperation between the two nations. The show was over and the crowd soon dissipated. 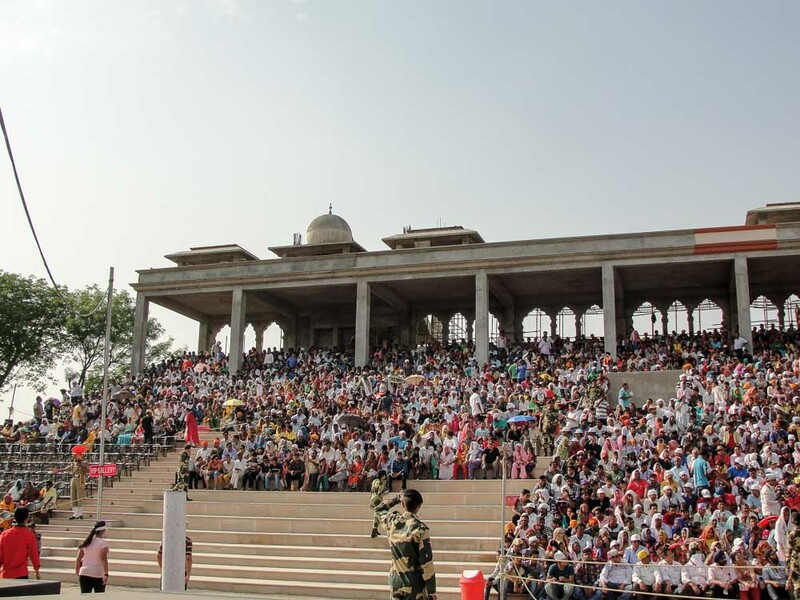 All in all, I would recommend a visit to the Wagah Border because the ceremony is really one of a kind. Although the sweltering heat is a bummer, the nationalistic atmosphere made it all worthwhile to attend the ceremony. 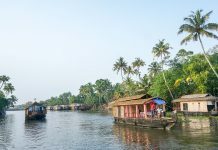 The visit is free, and you get to witness the locals in their element – dancing to Bhangra music, cheering loudly for India, and sharing their love for their countrymen with one another. 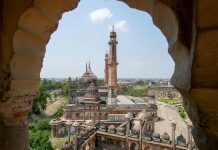 It gives you another perspective of India – one that exhibits loyalty and strength in unity. If you’re curious about what else there is to do in Amritsar, do check out our 60 Seconds in Amritsar Video too! Chong Ming loves to backpack - it is the way for him to immerse himself in a country's culture and understand its lifestyle. 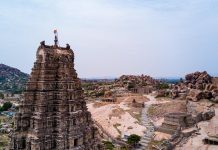 Besides his thirst for cultural knowledge, he travels for the stories he might be able to pen down (whether in his head or in his budding travel blog). He also dabbles in theatre and literature, and hopes to be a writer some day. 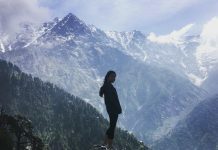 Can you Expects to what happens at Indian BORDERS? There are Wars…there are Merciless and killing all over…. BUT CAN YOU IMAGINE SOMETHING REAL INSPIRING AND HAPPENING AT ATTARIE BORDER .. When I was Small I use to watch an advertisement of “Fevikwik-todo nahi jodo”, that was the time I came to know about the WAGAH BORDER CEREMONY and the parade that was going on there. 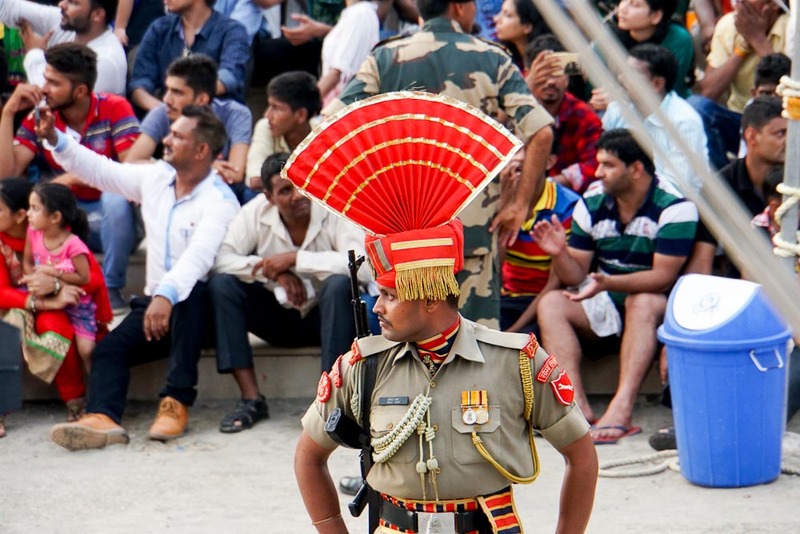 Because the WAGAH BORDER CEREMONY seems to be really happening somewhere across Indian borders I was really anxious to know about it after gathering information. So today I would like share some of my memoires of this CEREMONY with you all! 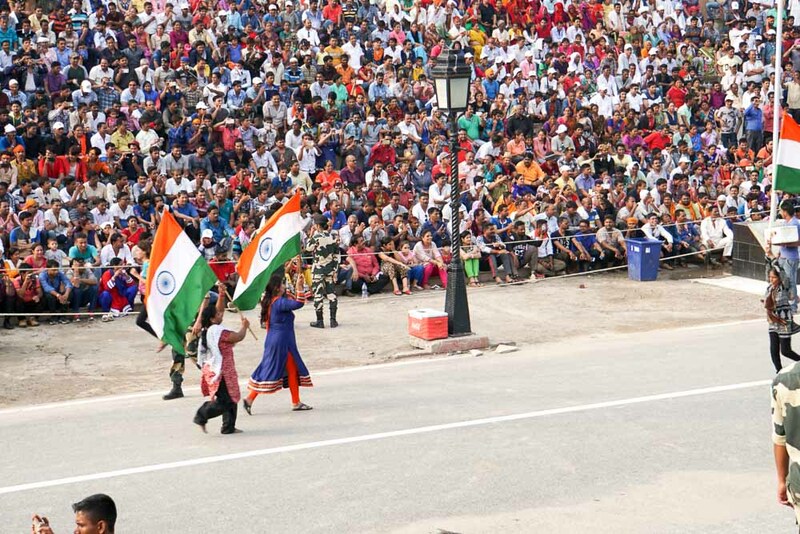 The advertisement characterized that the WAGAH BORDER BEATING RETREAT CEREMONY is a daily military practice that the security forces of India starts everyday prior to sunset. This ceremony takes place every evening before sunset at the Wagah border, which as part of the Grand Trunk Road was the only road link between these two countries, Amritsar(India) and Lahore(Pakistan).The ceremony starts with a blustering parade by the soldiers from both sides, and ends up in the perfectly coordinated lowering of the two nations’ flags. 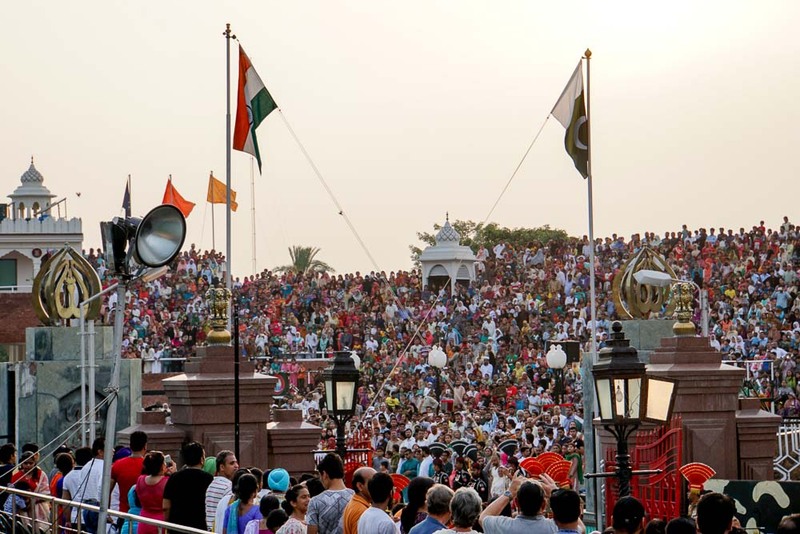 The WAGAH BORDER BEATING RETREAT CEREMONY was started in the year 1959 and since then The soldiers of this ceremony are specially appointed and trained for this auspicious ceremony. They also have a beard and moustache policy for which they are paid additionally. 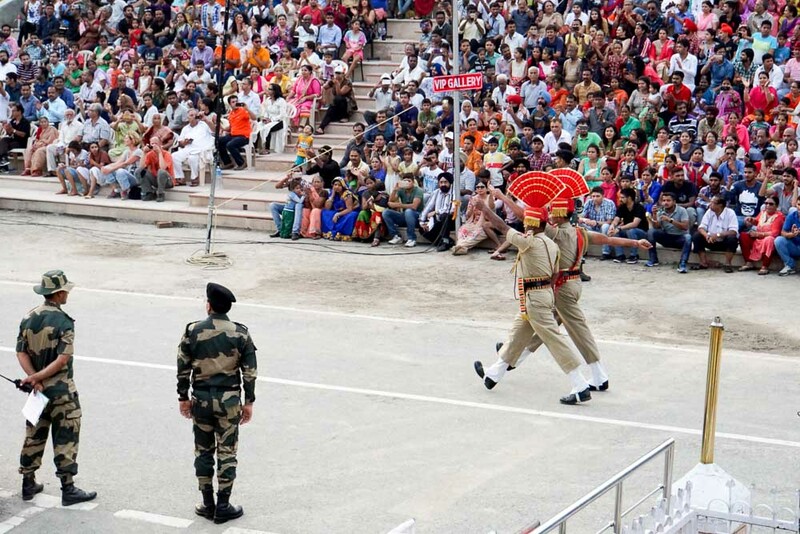 Border Security Force (BSF) of India and Pakistan Rangers of Pakistan, have jointly followed the drill and they participate and organize the parade. People from Both the countries and especially the local folks over as well as international tourists feel honored and privileged to be there!! To Capture the attention of everyone, the Indian Soldiers and higher officials play Bhangra music and there is an magnetize response from the Indian crowd. Indian Women irrespective of age factor, actively dance over there, small children run holding huge Indian Flags. Now a days there is a short cultural programme also done by local folk dancers. Both the Indian and Pakistani border forces of the border shout theis country names and a shouting March begins as the sun sets, the iron gates at the border are opened and the two flags are lowered simultaneously. The flags are folded and the ceremony ends with a retreat that involves a brusque handshake between soldiers from either side, followed by the closing of the gates again. Hope this WAGAH BORDER BEATING RETREAT CEREMONY , creates a very strong patriotism among every Indian. So .let’s promise to maintain the brotherhood for both countries all the time! I really feel like going there to witness those proud moments, on live! !